Your Mac or PC goes where you go. 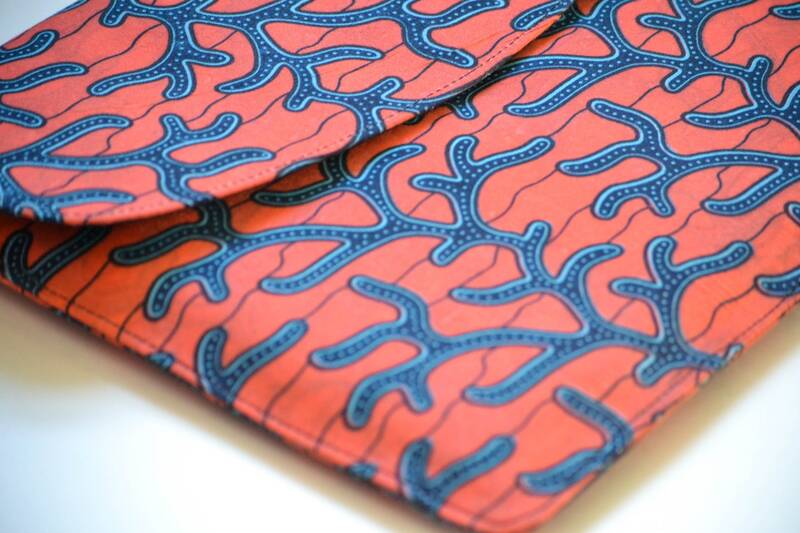 Now it can travel in sleek, protected style with this Ankara print laptop sleeve. 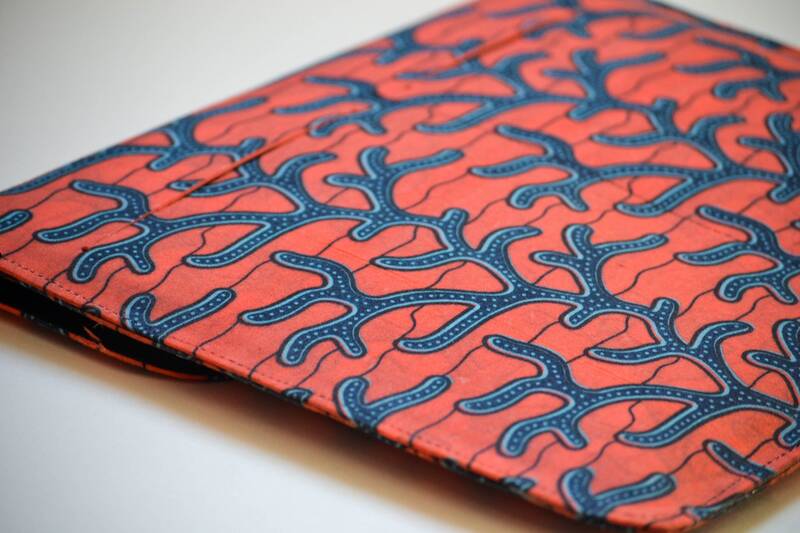 This laptop sleeve is made with an authentic African Ankara print exterior and a soft suede interior for protection against scratching. It includes additional internal padding for an extra layer of protection. 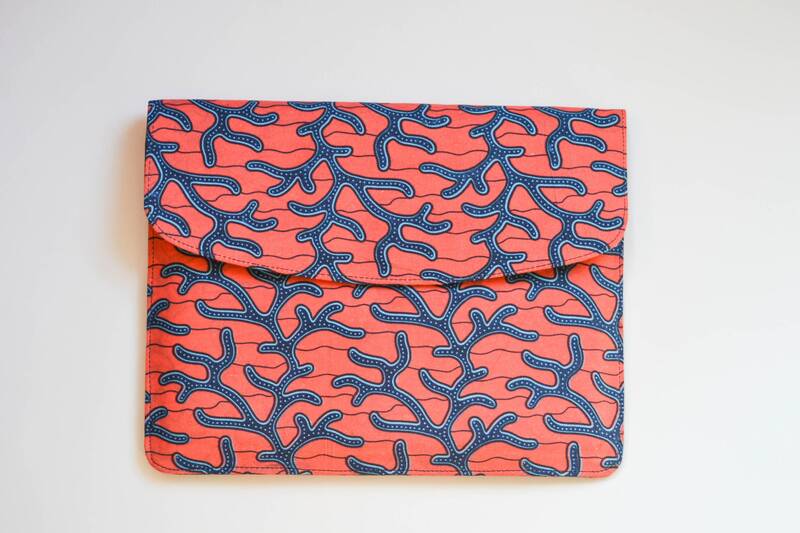 This laptop sleeve provides a main compartment for your laptop and a second, slightly smaller front compartment for a tablet, books, pads of paper, magazines, and other similar items. 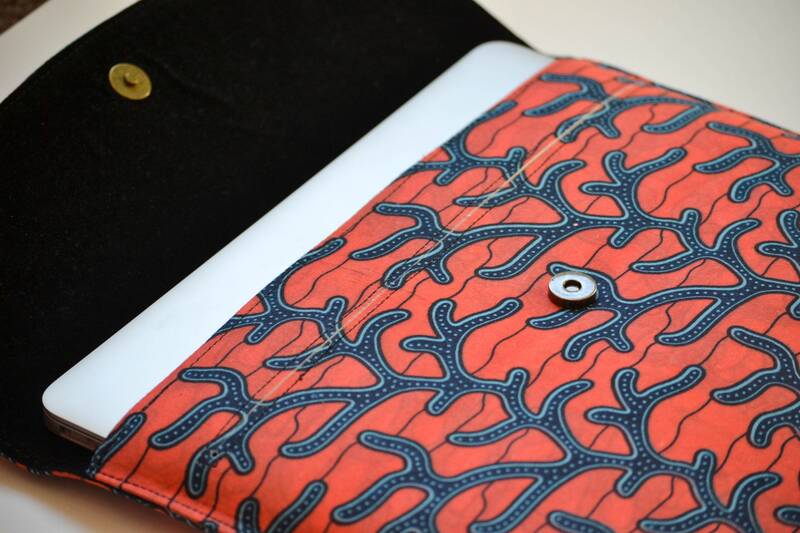 The laptop sleeve also comes with two back pockets for stashing smaller items such as a wallet, a smartphone, passports, earbuds, or ID cards. 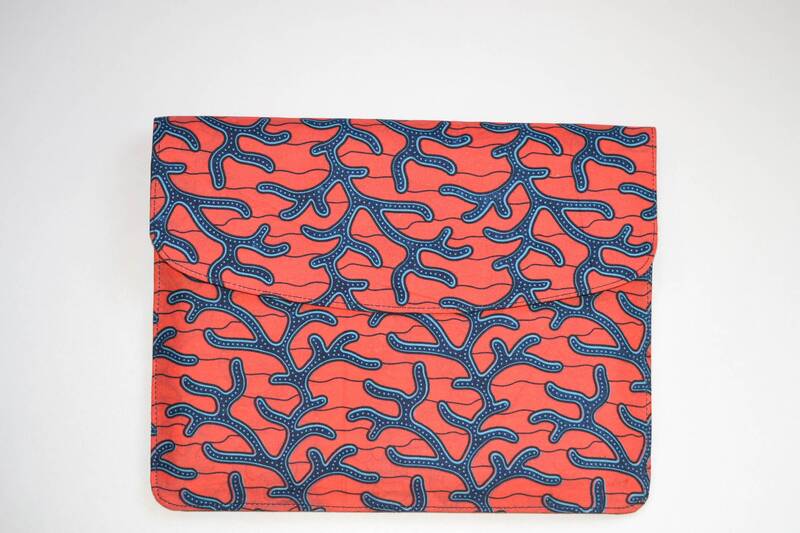 Use the laptop sleeve as a convenient carrying case on-the-go or as a sleeve before placing into another bag. Magnetic button secures the closure, keeping your device in with no-chance of falling out. 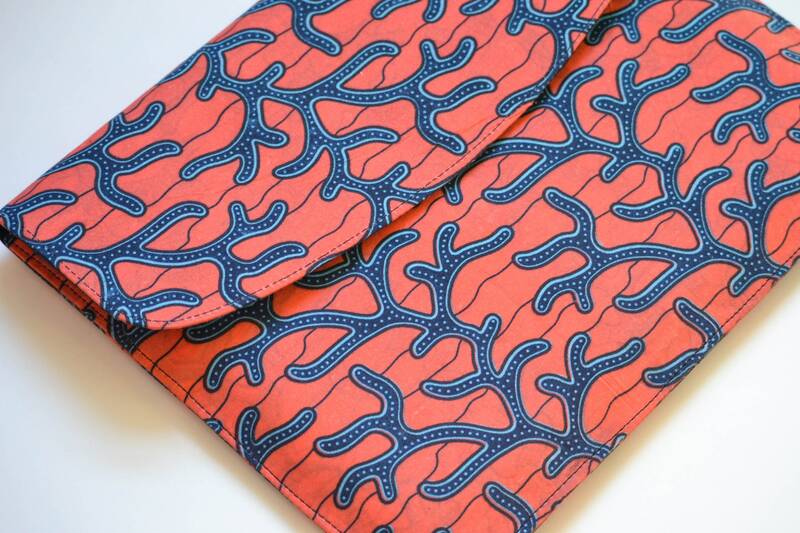 Made in Nigeria with authentic Ankara print, this laptop sleeve is truly unique and sophisticated. 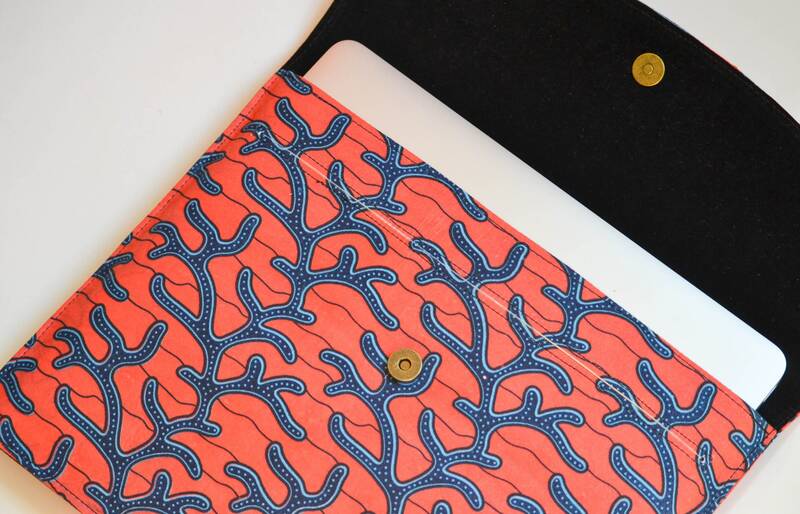 This laptop sleeve comes in two sizes: 13-inch, and 15-inch. Please see below for sizing details. 13-inch: Designed for 13-inch laptops. 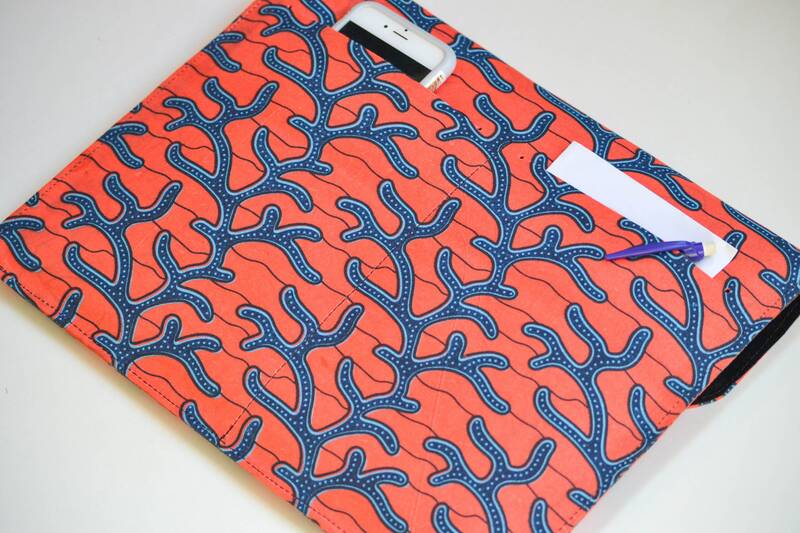 To ensure your laptop will fit our laptop sleeves, please make sure the total measurement of your laptop's width plus 2*height is smaller than the width of the laptop sleeve and your laptop's depth plus 2*height is smaller than the depth of the laptop sleeve. a) If your laptop measures 12 inches wide by 8.4 inches deep by 0.6 inches high. To ensure a right fit, you calculate the total width: 12 inches + 2*0.6 inches (width + 2*height) [13.2 inches] and calculate the total depth: 8.4 inches + 2*0.6 inches (width + 2*height) [9.6] inches. 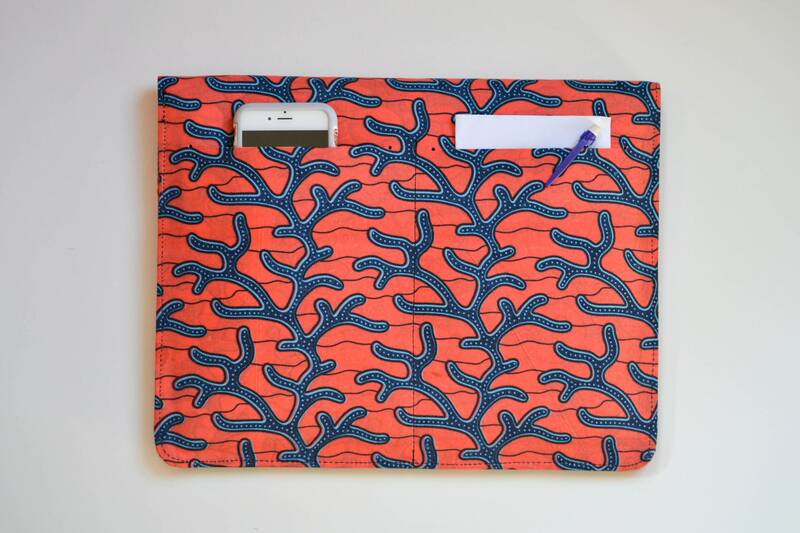 This would fit the 13 inch laptop sleeve which is 13.9'' x 10.3" (width x height). b) However, if your laptop measures 13 inches wide by 9 inches deep by 1 inch high, the total width: 13 inches + 2*1 inch (width + 2*height) [15 inches] and calculate the total depth: 9 inches + 2*1 inch (width + 2*height)  inches. 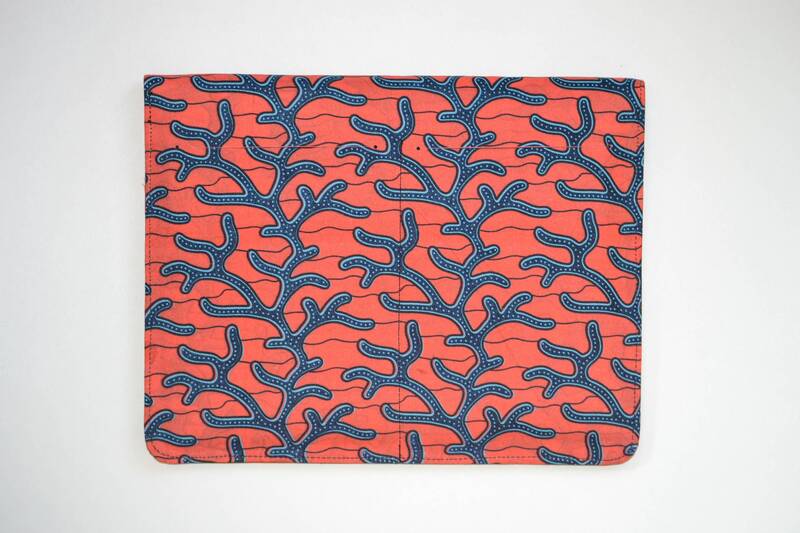 This would fit the 15 inch laptop sleeve which is 16" x 12" (width x height). Since laptops come in varying sizes, it is important to ensure the right fit. As a general guideline, please make sure your laptop's width and depth are at least 1.2 to 1.9 inch smaller than the external dimensions of laptop sleeve you intend to buy. If you have sizing questions, please do not hesitate to contact us.